I’m currently reading Roger Real Drouin’s No Other Way for a future review on this site. The novel centers on a quest to find and save the Northern Stilted Curlew, an Eskimo Curlew analog with an unfortunate taste for habitats that are about to be disrupted by fracking. The political and literary implications are many, but combined with my other recent readings, it spun my thoughts off in a strange direction. You see, I also spent some time lately recuperating from a bad cold (all the smoke everywhere does not help.) I deal with this sort of illness by lying in a hot bath drinking wine and revisiting beloved books of my youth, and this time out I chose Unexplained!, an encyclopedia of strange phenomena like UFOs, psychic powers, and cryptozoological creatures. Some of those mysterious creatures were birds. The most obvious place that cryptozoology and ornithology overlap is in the area of Lazarus taxa and would-be Lazarus taxa — the Ivory-billed Woodpecker, Eskimo Curlew, Pink-headed Duck, and the like — birds that no one doubts existed once, whether or not they exist today. 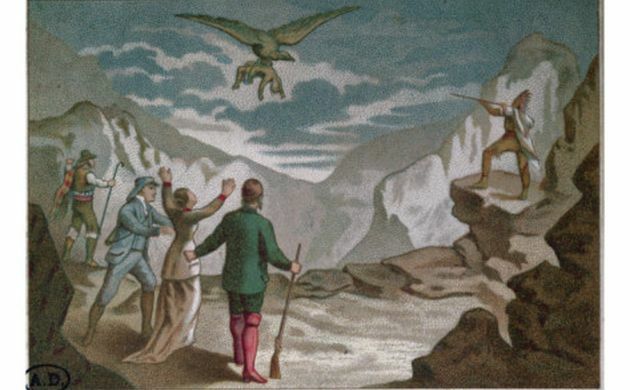 On the other extreme you have outrageous stories like the supposed Thunderbird photograph of the America West, ambiguous winged creatures like Mothman and the Jersey Devil, and the impossible but incredibly persistent belief that (modern, extant) eagles can and will carry off small children. Come on — obviously Photoshopped! What ornithology doesn’t seem to have is the strange demi-world that so haunts primatology, marine biology, and even herpetology — the loosely-linked collections of legends and field reports that seem to indicate the existence of species that are biologically plausible but officially unknown to science in the face of repeated searches — species like the Mono Grande and (until recently) the Giant Squid. Now why should this be? Birds are less compelling to human interest than our fellow primates, in many regards, but surely they are more arresting than a big wad of tentacled whale chow. Unexplained! mentioned a strike against the Thunderbird that may be a strike against all avian tall tales, quoting Angelo Capparella who notes that any undiscovered giant bird would have to be a master of evasion to go unnoticed by the “the legions of competent birdwatchers … scanning the skies of the U.S. and Canada” often with cameras at ready. But surely that’s a strike against, at least, all North American cryptids (you can’t tell me that even Sandy Komito wouldn’t drop what he was doing and digiscope Bigfoot if it wandered in front of him) and really no strike at all against the hypothetical cryptid birds of remote underbirded areas. Yet aside from the occasional speculation about a surviving Moa, we get little love. It’s not like it’s hard to flip through books of old bird illustrations and find things we can’t quite account for, but these just don’t generate the press that a hairy ape-monster would. I’m sure there are others we could sneak into your definition. It is interesting, as you point out, that these haven’t attracted as much attention as the weird would-be mammals; maybe the birds are _too_ plausible. Although the dickie-birds you list could have been juveniles, or hybrids, or plumage variants, Audubon clearly states that he measured the wingspread of the Washington Eagle at 10 feet, 2 inches. What’s your take on that? Just one of his tall tales? Rick, you’re right. The problem isn’t a lack of candidates by any means, just a lack of publicity. Steve, clearly the Washington Eagle IS the Thunderbird. We should try to get some publicity out of that. Steve, I think it was Audubonian exaggeration combined with his notorious inability to back down from an earlier error. Where Are You Birding This Second Weekend of October 2008?